In January we were lucky to have a second visit from Wonderstruck. They came to school and treated the children to a morning of science, this was based on the solar system. The children learned about the order of the planets and were challenged with the task of making motorised planet-exploring vehicles without wheels which were then tested on ramps. They also watched an exciting demonstration about meteors. We would like to thank the PTFA for funding the visit. Later the same day, the whole school took part in a STEM afternoon. 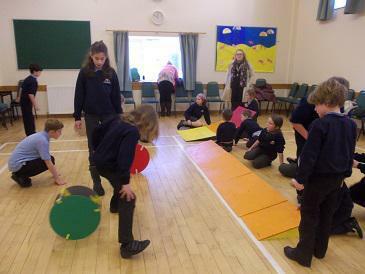 The children have been taking part in a competition - to promote Science, Technology, Engineering and Mathematics - which is based across the schools within North Devon and the surrounding areas. The competition involved seeing which team could build the tallest tower (that stands on its own) and which team could build a strong enough tower to hold an egg for as long as possible. Each team worked very well together ensuring that everyone's skills were used whether they were designing, discussing or putting the tower together. We are now eagerly awaiting the results to find out which schools won this challenging but exciting competition.